1. Drilling a small hole allows you to check the exact location on the point. The scribing will not obliterate the hole. You may wish to drill holes where scribed line 2 crosses the horizontal lines 3 and 4. 3 and 4. After you have scribed deeply you can remove the metal strip and continue scribing until you have cut through the fuselage. I used both an Xacto razor saw and Hasegawa / Tritool saws. Take care to keep the angle of the saw blades at a 90 degree angle to the fuselage centerline. 5. DON’T saw this line until you have completely cut through lines 3 and 4. It will make the fuselage weak and hard to manage. 6. Saw only down to vertical cut 3. DON’T cut the nose off! The ‘humps’ over the cowl guns are too high; causing a deep trough between them that will need to be corrected once you have the fuselage assembled and can evaluate the appearance. Some filling will have to be done around the base of the windshield as it is moving back 1 mm when the front end of the cockpit is corrected in step 8. The top apex of the fuselage tapers upward from the leading edge of the vertical stabilizer fairing until the cockpit sill is 3 mm too high above the rear spar (station 4). It then droops downward until it is 1 mm too low at the rear edge of the cowling. The kit cowling is correct in diameter at the front. It is a tube whereas the real cowling rises slightly to the top rear apex. A pair of cuts must be made at the 3 and 9 o'clock positions of the cowling and styrene wedges placed to increase the rear edge vertical depth from 48 to 49.5 mm. Cowl flaps are separate moldings and will have to be given a similar treatment. The top of the fuselage at that point can be built up with putty to match the cowling or the firewall can be heightened by 1mm to push up the fuselage top. I notice that on some Type 21s, the top rear cowling edges evenly mate with the fuselage contour and some cowlings are a little higher at this point. The chin carburetor intake is correct in profile for the first 20% of its length but then angles upward, causing it to be too shallow - 3 mm at the deepest part where it should be 5 mm. It is also too short and will have to be extended at the rear. The oil cooler intake is totally bogus, apparently taken from the one on the Zero in the Tokyo Science Museum. A correct one would best be made by vacuum forming. The fairing for the kit drop tank is 10 mm deep where it should be 6.5mm deep at the front end and 5.5 mm at the rear end. The way I corrected the profile of the kit is shown on the plan notes. After the cutting was finished and prior to compressing the wedges in the fuselage sides and gluing them together I measured the positions of the oval access panels and rivet/panel lines in the cockpit area so I could rescribe them. I re-assembled the fuselage halves and used sheet styrene to reinforce the seams inside the rear fuselage. My scoring and sawing was imprecise so I also ended up putting some sheet styrene shims at several points along the joins. The curved canopy channel was built up to a straight line by inserting shallow wedges of .015 styrene sheet. Wing airfoil corrections remain to be attempted. The kit wings have a continuous taper. 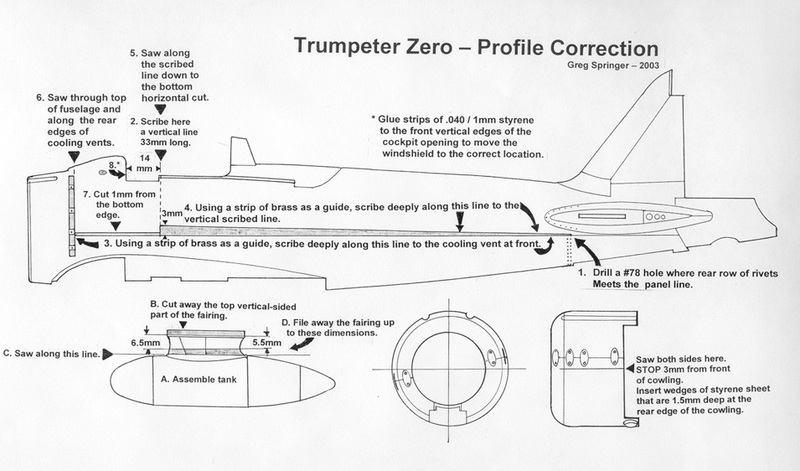 The actual Zero wing upper surface taper changes at the ribs just outboard of the cannon bays. It then tapers at a shallower angle to the wing tip. The outer wings also have a shallow ‘twist’ causing leading edges to angle slightly down by a degree or two. I seem to recall reading that they indicate the beginning of a stall so that the pilot can take action to prevent a full stall condition. Three oxygen bottles are included for attachment to the rear face of the cockpit bulkhead. This is correct for a Type 52. Remove the left hand one from part C15 and use it for the compressed air tank that lies on the bottom of the fuselage. Formers and stringers are included almost all the way back in the fuselage. Certainly farther than can ever be seen. None of the other equipment is provided. You may want to make the hydraulic reservoir, battery box; RDF CPU and dynamotor as these would be visible to anyone shining a penlight over the seat through the bulkhead opening. The inner rear fuselage is covered with ejector pin marks, forty on each side. Those in the forward areas where you may wish to add detail will need to be filled, scraped, and sanded. In the engine compartment the oil tank is the later type found in Types 32, 22, 52, etc. The fuselage fuel tank is square in cross section, not contoured to the fuselage as on the real aircraft. Drawings of both tanks are found in Model Art 323 and the newly re-issued Green Arrow Zero books. I used these drawings to manufacture new tanks. The engine bearers are a joke. They are very thin and weak. I can’t imagine that they will support the weight of the cowling and engine assembly. I will replace mine with brass rods. A very bizarre part of this kit is the inclusion of wing cannon, ammo drums and ejection chutes. However they simply sit on pins inside the wing with no detail parts or engraving around them and no provision for visual access. Trumpeter’s mold cutting budget must have run out too soon. In the cockpit we are given part C23, the late type elevator trim wheel-with-central crank combination. Remove the crank and fill the lightening holes to correct. The mount point for the wheel is incorrect for a type 21. File it so that the trim wheel angles outward at the front. Cut the trim indicator from the frame and angle it to match the wheel. At the rear of the side casting, part C13, is a late model fire extinguisher control panel where the radio dynamotors module should be. Remove it by sawing. The console, C10, has four instrument openings instead of three but otherwise is a good basis for detailing. I cut away all details on this part. The two rear holes for the fuel indicator gauges were enlarged by filing and reaming. Turning down pieces of sprue to the correct diameter, gluing them in place and filing flat filled the two small holes in the forward half of the panel. The third instrument hole for the air temperature gauge was then drilled. The electrical distribution panel is pretty accurate. I cut it out to facilitate adding wiring. Speaking of wiring and piping, some aftermarket auto detail manufacturers, like Sakatsu and Detail Master make 1/24th scale toggle switches and compression fittings that can be used on this kit to good advantage. The right side cockpit casting has the hand pumps for landing gear and flaps. Very nice! The radio control box, C38, is the late Type 3-1 and you are asked to place it where the RDF control box should be. The RDF box, C37, is a good basis for accurizing using the drawings in my article on early Zero radio systems found in j-aircraft's Reference section. Type 96-1 radios are not included. If you are building a land-based Rabaul plane, no problem. If you are building a carrier-based subject, you will need to make and install them and the dynamotors. If your pilot has Morse code training you will need to make a telegraph key and place it where the instructions tell you to put the RDF control box. Again, see the radio article. Part C29, the tail hook retraction windlass has the center part of the crank but you will need to make the drum for the wire and an extension of the crank handle and housing. I removed most details that were molded as part of the sides of the cockpit structure. I replaced the longerons and one small former that had to be cut away with 1mm / .040 styrene strips. Another problem with the cockpit is that the lightening holes in the box formers above the rear spar are only present on the left side of the cockpit. The actual structure of the cockpit is very well done except for the floor which is flat. The real cockpit floor is the top of the wing so I bent the kit part to match and cut new locator notches 3mm lower in the rear cockpit bulkhead. Compressing the fuselage simply lowers the cockpit module and no fitting had to be done to compensate. The seat has two problems. It is 2mm too tall and the sides and front of the seat pan are almost nonexistent. The control column seems a bit anemic so I will replace it and add a cloth ‘boot’ to its base. In front of the cockpit there are no ammo magazines, feed chutes or shell ejection chutes. Back to the Green Arrow Zero book for hints on how to scratch-build them! The best illustrations of a Type 21 cockpit is a pair of centerfold painting in Gakken's Zero Fighter book Vol. 12. Equipment mistakes I found in these illustrations are that the radio faces are speculative and the dynamotors are painted black when they should be bare aluminum. Please refer to my article on radios in the j-aircraft Research section. The crank on the cockpit floor labeled # 30 I believe to have been introduced at some point in the Type 21s production run but it was not present in AI-154 at Pearl Harbor. There should be four T-handles on the small box behind the crank as the kit has. Two of these are for the fuel tank cooling vents; two are to release the landing gear up-locks. The kit box is too shallow and should be replaced. The colors of the interior are not correct in the paintings. As I continue to work on this kit, I will send in more reports.